Boulder City first-year baseball coach Bobby Reese knew he had a talented team despite the Eagles making the jump to a new, larger and more competitive league. Reese inherited nine seniors, and one of them was Tanner Howell. Howell, who led the team to an undefeated season in league play and state runner-up finish, was named the 1-A all-Southern Region Most Valuable Player. He was named to the first-team squad for both pitcher and shortstop. Howell hit .491 with five homers and 58 RBIs in 35 games, and scored 47 runs, all team highs. He also had a team-high 12 doubles. On the mound, he went 5-1 in 13 games, with 2.43 ERA. He struck out 84 batters, including 11 in the winner’s bracket final against Faith Lutheran on May 17. “Tanner was a unanimous selection by all the league coaches,” Reese said. “The coaches respected the fact that he was our ace and that when not pitching he played one of the toughest positions defensively. Joining Howell on the first-team were fellow seniors catcher Billy Barth and center fielder Corbett Fleming. Barth hit .415 with two homers, nine doubles and 38 RBIs. He threw out nine base runners and tied for the top fielding percentage on the team at .977 among regular starters. Fleming might be the biggest surprise entering the season. Howell and Barth had garnered all-state honors as underclassmen, with Fleming receiving second-team all-region honors. After struggling with hitting at the end of last season, even being benched in a game late last season, the senior hit .402 in the lead off spot, leading the team with 59 runs and 18 walks. He also set a school record of 38 stolen bases in 41 attempts. Reese said he was happy with the leadership the three showed during the season. “I am proud of those three seniors, Tanner, Billy and Corbett, and all the other seniors for that matter, for what they did this year and for the program,” Reese said. The Eagles went 25-11 overall and 12-0 in the Sunrise League with 10 seniors, seven of whom started on a regular basis. But the team wasn’t all upper classmen. Freshman Peyton Koopman was named to the all-region team as designated hitter with a .314 average. The group, joined by senior teammates Tino Ragone and D.J. 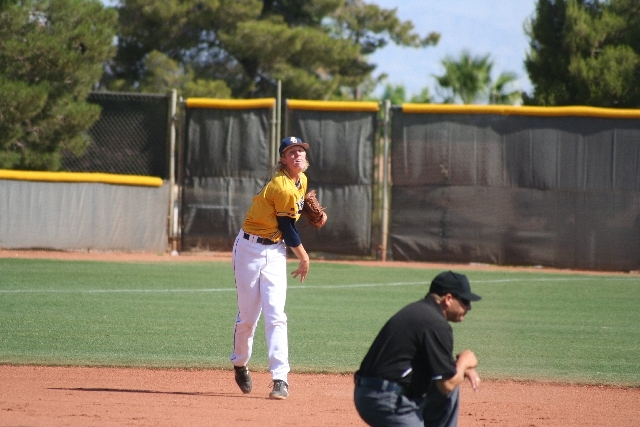 Koopman, played May 23 in the Southern Nevada Baseball Coaches Association Division I-A All-Star Game at the College of Southern Nevada. Howell led the way going 2-for-2 with a double, two-run homer, three RBI s and scored three times as the North defeated the South, 18-9. D.J. Koopman added a double, and Peyton Koopman contributed an RBI triple in the win. Howell’s RBI double, an RBI single by Barth, and an RBI triple by Koopman highlighted the 10-run first-inning. Howell added his home run in the third inning.